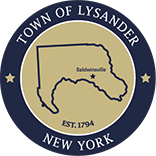 New property owners in Lysander should notify the Tax Office as soon as possible. It takes time for changes in house ownership to be reported to the tax office and appear on the tax roll. Therefore, a tax bill may be sent to the previous owner until the changes are properly recorded in the formal tax roll. For your own protection call and inform the Tax Office of the address where you want your tax bill to be sent. It is each homeowner’s responsibility to make sure tax bills are sent to the correct address to ensure timely payment.